The trip from Westport to Lake Moeraki is straight down the West Coast of New Zealand on Rte 6 the entire way. It was just about 400 kilometers, and took me through the towns of Greymouth and Franz Joseph Glacier, as well as some smaller places. 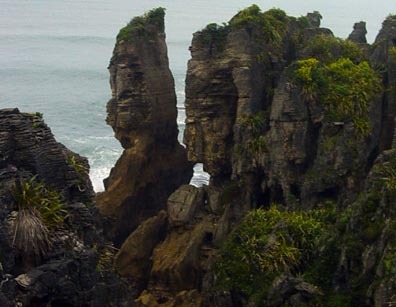 After leaving about 7 in the morning (just about daybreak), I made my first stop about 30 km down the road at a place called Punakaiki. 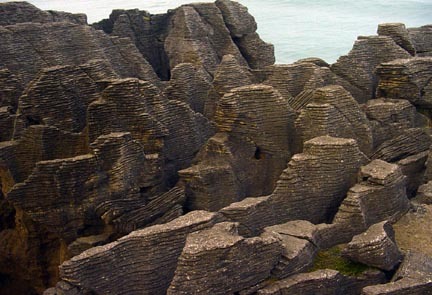 This is the site of a geologic formation known as "Pancake Rocks". 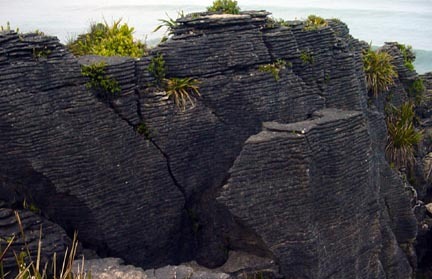 These rocks were formed of layers of sandstone sandwiched with layers of mudstone, and were then uplifted and eroded by the wind and surf. The effect is interesting, and it was well worth the visit. 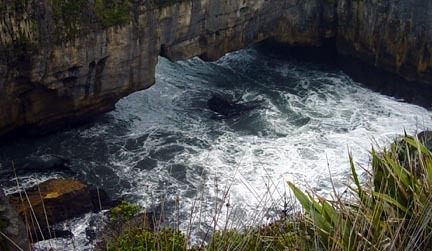 Some of the erosion has created caves and blowholes that spout water when the tide and surf are right. When I was there, the ocean was fairly calm and I didn't see a spout. That early in the morning, the only people in the region were three European backpacking kids in the parking lot, brushing their teeth, so I pretty much had the run of the place. The final formation above is supposed to have a number of animal figures in it. How many can you see? 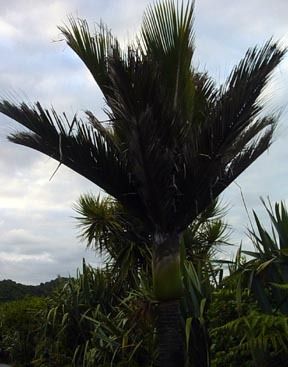 On a natural history note, around Punakaiki, there are many examples of the Nikau Palm. There are groves of them along the road. This is the most southerly occurring natural species of palm tree. 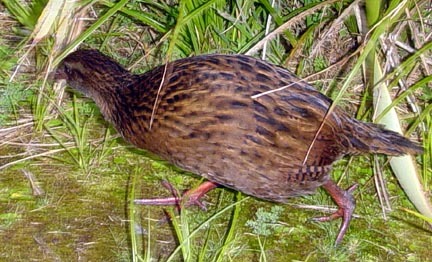 While I was walking back to the car, I heard a rustling among the New Zealand Flax plants lining the walkway, and a Weka popped out, right at my feet. Wekas are endemic flightless birds in New Zealand that are related to the rails of this country. There are about four varieties or color phases of them found in the country, and this was the dark brown West Coast variety. It was very tame, and let me get a good picture of it. Rather shy and retiring, they are tough to find in the thick cover they inhabit. 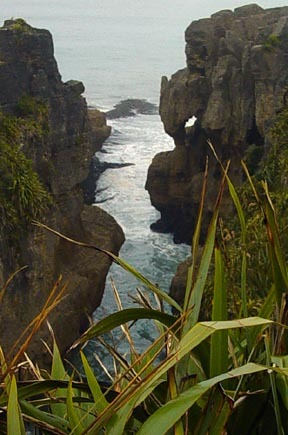 Down the road a piece from Punakaiki, is the town of Greymouth (located at the mouth of the Grey River). This is a larger town than Westport. It is the terminus of the road coming across from east that goes through Arthur's Pass--a popular route from east to west. It also is the home of Monteith's Brewery, which makes pretty good beer. It would have been fun to stop for a brewery tour, but it was still early in the morning (lots of kids going to school along the road), so I went right through. I also didn't stop at Hokitika, which is about 40 Km below Greymouth. This is a center for the jade (greenstone) carving business that is the domain of the Maori's. The west coast is known for its jade deposits. The next stretch of road went through fairly flat cattle country, with many more beef cows than sheep. Just an occasional town (Ross, an old gold mining place; HariHari, Whataroa, etc.) I did pull over at HariHari and had a late breakfast, or an early lunch of toast, jam, and hot chocolate. Very English, and very good. The road is now a good bit back from the coast, and moved into the hills again, toward the Glacier towns of Franz Josef Glacier and Fox Glacier (the English tourists say, "Glah-si-er"). These are receding glaciers that feed from the Mt. Cook complex of mountains. Mt. Cook is over 12,000 feet high, and is the tallest mountain, I'm told, between Papua, New Guinea and South America. It also has come down a bit, losing 66 feet of altitude when chunk of its summit broke off a few years ago. The town of Franz Joseph Glacier is a bustling, touristy place with all sorts of hawkers of helicopter, plane, and bus tours of the glacier. You can see some of the glacier from the road, but I blew right through town, preferring to stop at the less traveled Fox Glacier down the road about 25 km. 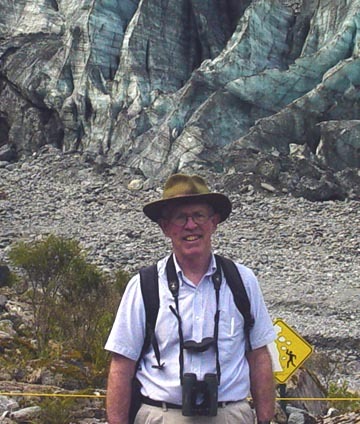 This was a wise choice, since far fewer people visit Fox Glacier, and the town is practically non-existent. 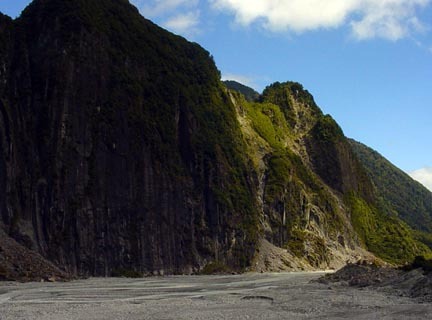 After driving for a few kilometers up a dirt access road, you can park the car along side the rushing stream fed by the glacier and walk about a kilometer to within a decent distance of the glacier's face. Here are some pictures. This is how the face of the glacier looks as you first see it, and then approaching more closely. 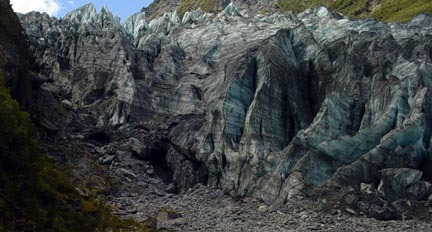 The melt water running out from under the glacier is milky from the rock that the pressure of the glacier has ground to a flour-like consistency. From top to bottom, this is what the glacier face looks like from right to left. And yes, I am in New Zealand, and that is me on the right. Looking below the glacier's face, the cone-shaped rock on the right is identifiable in early photographs of the glacier. 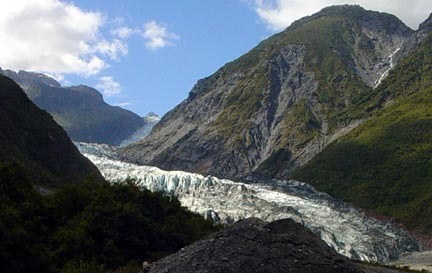 In 1750 it is estimated that the top of the glacier was even with the top of the cone, and the glacier extended a kilometer or more downstream. In 1948 the ice was only halfway up the cone. Today, the face of the glacier is several hundred meters upstream..
From Fox Glacier it was a long and lonely drive down the coast to Lake Moeraki. There is not even a gas station on the route that passes through almost no villages. But I safely reached the Wilderness Lodge at Lake Moeraki, about 32 km above Haast. Here, I was greeted sumptuously, and quickly installed in a wonderful room with amenities and the prospect of family type meal service with the other guests. To unwind after the 400 km trip from Westport, I took a 30 minute walk down to Munro Beach on the Tasman Sea. 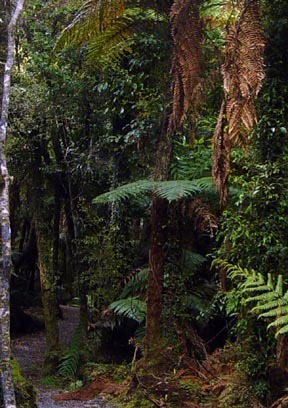 The track wound through a dark a forbidding rain forest featuring tree ferns and immense silver beech and rimu trees. 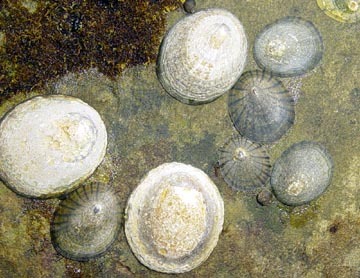 At the beach, the sand flies were ferocious, but I did note the intertidal rocks were encrusted with limpets--something we don't see on the east coast at home. After a wonderful gourmet meal of venison tenderloin, served family style with great company, a number of guests went along on a short evening nature walk along the road (rte 6) near the lodge. 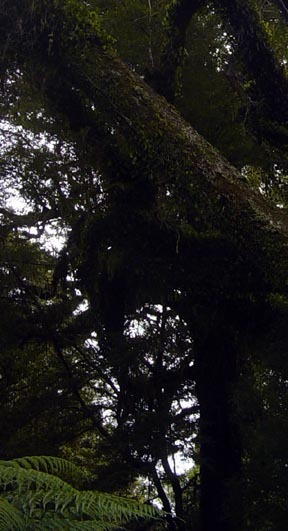 The objects were to see glow worms along the shaded road cuts, listen for the local endemic owl, "More Pork", and to view the Southern Cross constellation. The latter was easily visible, just 180 degrees from Orion. The New Zealand flag shows this constellation on a field of dark blue, with a Union Jack in the upper left corner. Our quest to hear a More Pork, however, was in vein.  This is a small owl, fairly widely distributed, but never common. The glow worms were easily visible, insect larvae that bioluminesce. While we usually think of them as cave creatures, they survive in dense vegetation in places that remain shady all day long. Waking up before dawn the next morning, I raised my window and did hear a More Pork calling in the distance. The owl gets its name from its call--"more pork........more pork". It was higher pitched than I'd expected. Tomorrow I'm set for a guided nature walk along an old cattle driving trail that parallels the Southern Alps Fault line above Lake Moeraki. I'll report on it.